Music Boxes from the uks leading supplier of music boxes, The Music Box Shop. The music box is wound from underneath. 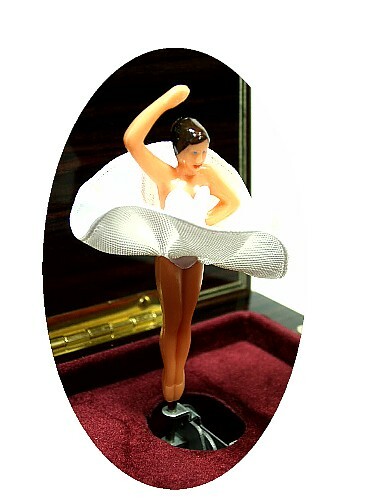 When you lift the lid the music plays, and the ballerina turns to the music of the 18 note movement. 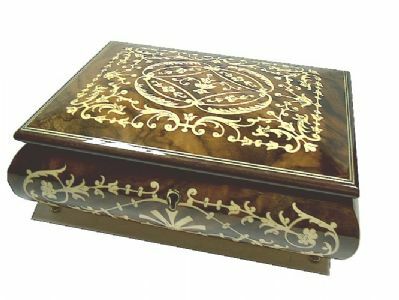 The box is inlaid with an arabesque design. This musical jewellery box is finished in a gloss lacquer with a waulnut veneer. Please note - although we take as much care as possible to show pictures of the actual product, because this is hand made, the colour may naturally vary slightly from those shown. From time to time depending on our stock, the figurine may differ from that shown if you want to check which is currently being fitted please telephone our sales office who will advise.